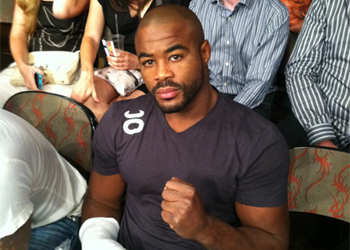 As expected, Rashad Evans (Pictured) and Phil Davis will headline the UFC’s follow-up show on FOX. On Saturday, the world’s premier MMA promotion announced the light heavyweight affair will serve as a top contender scrap. Evans bumped his record to 16-1-1 after steamrolling Tito Ortiz at UFC 133 this past August. Although it wasn’t one of the most difficult fights of his career, Evans would up injuring his right hand in the processes and had to go under the knife. His surgically-repaired haymaker has kept him sidelined since the victory. Davis was originally slated to face Evans at UFC 133, but hurt his knee at the 11th hour and has been riding the pine ever since. “Mr. Wonderful” owns an unblemished 9-0 resume and most recently hung a lopsided unanimous decision win over Antonio Rogerio Nogueira this past March. The United Center in Chicago, Illinois will host the January 28th event. The show is co-headlined by a middleweight top contender showdown between Mark Munoz and Chael Sonnen.